As you probably know, periodically I like to take part in an online swap. Usually these swaps have to do with knitting in some way, but often there is a secondary focus. 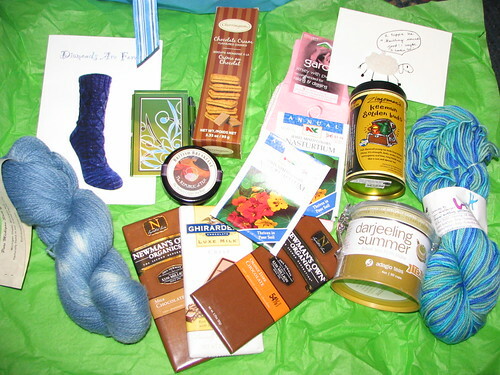 This spring’s swap is tea-themed. Kelle sent me a box. A big box. An exciting box. It arrived as I was on my way out the door for work, so I had all day to think about what might be included in such a box. Anticipation is a good emotion. I’m really good at anticipation. 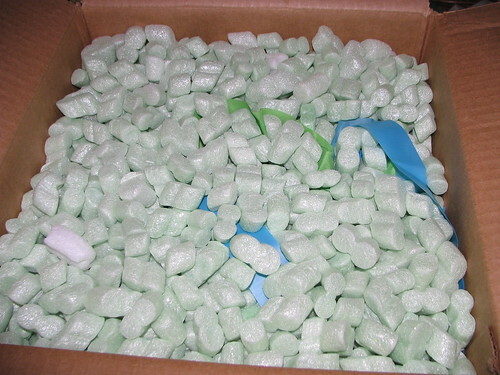 What could be contained in the depths of such styrofoam peanuts? Hints of blue and green peeked through to offer teasers. Isn’t that an awesome package? And the best part? It’s themed. Kelle incorporated many things from her home state of Michigan to give me a truly unique present. There are two skeins of Michigan yarn. 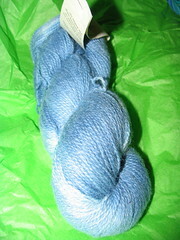 One is a wool-nylon blend that I suspect will wear like iron and show great stitch definition and that matches the sky. 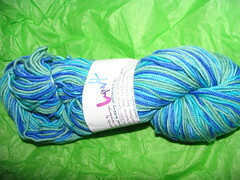 The other is a squishy merino-cashmere-nylon blend in a blue-green colorway called River’s Edge. And there’s a cabled sock pattern from a Michigan designer. Kelle included three teas. One comes in a travel tin so I don’t ever have to be further from a cuppa than a pot of boiling water. One is a summer Darjeeling blend in a cool canister. I’m looking to kicking off the summer season by brewing some up this weekend. 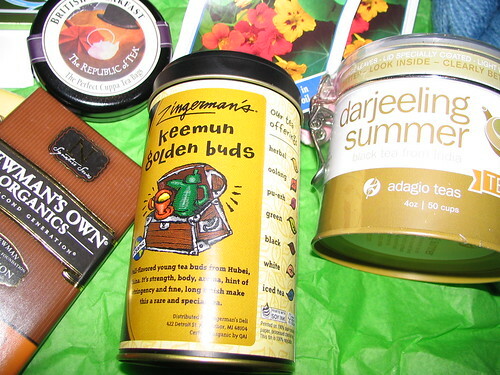 The last one is from a famed Michigan foodie and is my favorite blend of tea — Keemun. Plus there are cookies and chocolate bars. Yum! Thank you, Kelle! 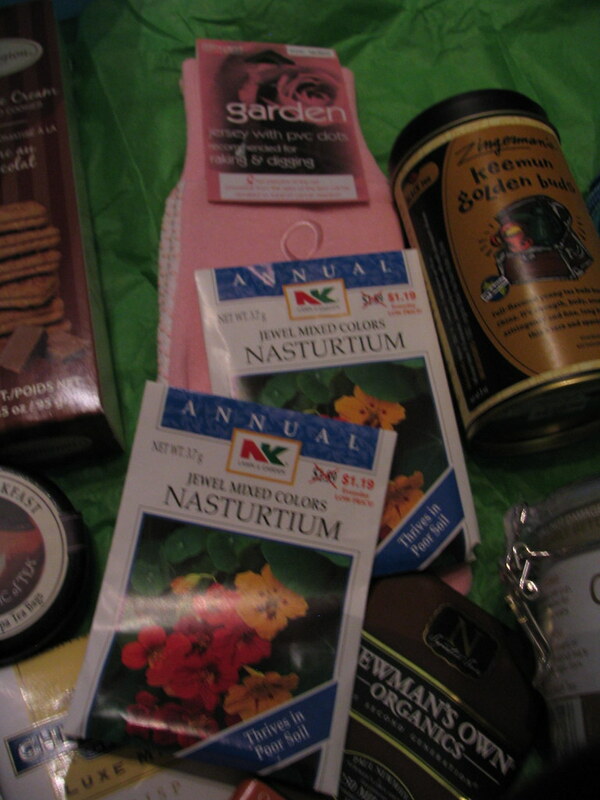 This is fantastic and has really made the receiving end of the Spring Fling Tea Swap a ton of fun! I hope you enjoy your end of the swap, too. Ohh, so exciting!! What great treasures were contained in the box!! Let me know how the summer darjeeling is, if you can – I was just eyeing (that word looks wrong both with and without the second “e.”) it on Adagio! 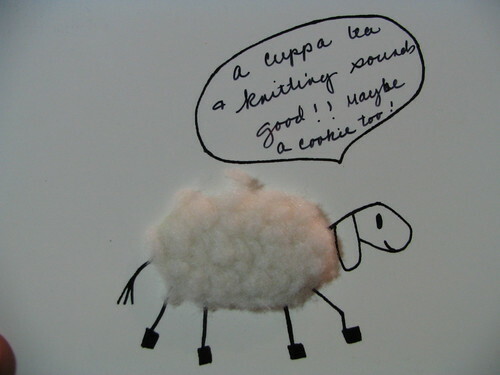 Love the fuzzy sheep card – awww! @Jenn: Both Rudi and I are liking the summer Darjeeling. I’d buy it.